Memiah is a company with heart ❤️️ - Good mental health and wellbeing are at the core of what we do. Two sisters who set up Memiah in 2005 after experiencing anxiety and depression themselves. They are passionate about helping people find their inner happiness. Memiah was founded in 2005 by two sisters, Aimi and Emma. They both suffered from anxiety and depression when they were at school and university, but back in 2005 there was even more of a stigma around mental health than there is today. They didn't want to talk to their parents, they didn't want to talk to their family doctor and they didn't even want to talk to each other about their worries. Emma was in her final year at Uni and she knew she wanted to find a counsellor, but back then her only options were to ask her doctor or to look one up in a phone book. When you are about to tell someone your innermost thoughts, you want to know a bit about them than just their name and address. Emma thought that there must be a better way, and so the idea for Counselling Directory was born. Counselling Directory would list only qualified and insured counsellors, and would let you view profiles to compare their individual approaches and experience. To promote a healthier, happier society by nurturing ideas, growing businesses and bringing people together. Over the next five years, Memiah created five websites to do just that; connecting those in need of help, to a professional who can. These websites include Counselling Directory, Hypnotherapy Directory, Life Coach Directory, Nutritionist Resource and Therapy Directory - a network of over 21,000 professionals. We are proud of our directories - they are what has helped us cement our authority in the wellness industry and has helped us to define the future of Memiah. In 2017, Happiful Magazine was born - a product of all of our directories coming together - to further challenge the stigma around mental health and promote wellbeing. 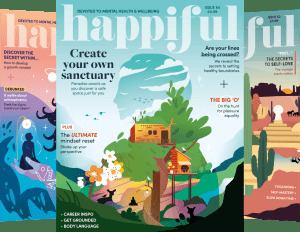 Happiful Magazine’s aim is to provide informative, inspiring and topical stories about mental health and wellbeing. We want to break the stigma of mental health in our society, and to shine a light on the positivity and support that should be available for everyone, no matter their situation. Together, our monthly Happiful magazine and online directories make up Happiful. Happiful is the future of Memiah. We are dedicated to sharing the stories, experiences and support available for the whole of our society and we will work continually to ensure we represent and speak to the broadest audience possible. We are on a mission to create a healthier, happier and more sustainable society. We act with the highest ethical standards and deliver our promises. Our service is continually developed around feedback from customers to ensure it’s the best it can possibly be. We fully support each other as a team, and treat our customers the same way. We are truly passionate about the service we provide, and the continual development of it. We treat each other and our customers with the same values we’d treat our family with. We’ve signed the Employer Pledge to demonstrate our commitment to change how we think and act about mental health in the workplace and make sure that our employees who are facing these problems feel supported. We want to minimise our impact on the environment. That's why we have our eco-pledge. We've worked with ClimateCare to offset our carbon footprint. And, for every tree used to print Happiful magazine, we will make sure that two are planted in its place. In January 2018 we partnered with the Community Matters Partnership Project (CMPP) in order to help support projects in our local community. To celebrate our partnership, we took part in a day of volunteering for all our staff, some of whom will attended a CMPP Give and Get day.